We are celebrating 29 years in business this year. We started in 1987 in a small rented 500 square foot bay in Lake Park, Florida. The business was started by Matthew Recchio and his wife Paulette and included throughout the years their 3 sons Rick, Tony and Phil. In 2001 Matt & Paulette bought their own 3000 square foot building and moved the business around the corner to 348 10th Street, Lake Park, Florida. Over the years we have built a great reputation and a large customer base. We do residential and commercial installations. Since the hurricanes of 2004, we have become a local dealer for Plaza Door Company and now specialize in replacement of hurricane impact doors and windows in many of the condominiums and homes in our area. Our staff has had many years of experience in the glass industry. 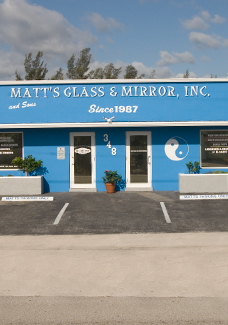 We at Matt’s Glass and Mirror appreciate your business and hope to serve you for many more years to come.